The HTC Wildfire SIM Free is the smaller version of the hugely popular HTC Desire - it runs the same version of Google Android so you get all the same functions at a lower price. The screen has a web browser comparable to the iPhone, and you get 7 home screens to place your favourite widgets to Facebook, Email and more! 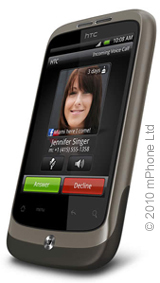 Buy HTC Wildfire SIM Free for use with any GSM or 3G SIM card / line including all those on UK networks like O2, Vodafone, Orange, T-Mobile, Three and Virgin (pre-pay and contract).